1968 will be remembered for many events, but in the world of film there were two notable occurrences: the Cannes Film Festival was cancelled and science fiction stormed to the top of the US Box Office. Kubrick's 2001: A Space Odyssey may have perplexed audiences and critics alike but clearly captured the imagination of the audiences, in the US finishing the year with second place in total takings. This was first time in over a decade that a science fiction film had finished in the US box office top ten, a result not repeated until A Clockwork Orange in 1971. Even more remarkable was that it not alone, with Franklin's J Schaffner's Planet Of The Apes also making the list at number seven. Whereas the other science fiction films of the early 60s which spring to mind (specifically La Jetee and Alphaville) were of more economical means, both these films were lavish and technically sophisticated productions, with Kubrick picking up an Academy Award for Best Visual Effects for and an John Chambers an honorary Academy Award for outstanding achievement in make-up. Viewing 1968 solely through the lens of history it is useful to take a moment to reflect on some of the tumultuous events of this year. As well as the unrest in May 1968 which lead to Cannes being cancelled, a series of worldwide protests spawned new political activity on all sides of the political spectrum. In the US the Civil Rights movement gained momentum and at time Johnston's administration at times struggled to maintain domestic peace. The assassination of Martin Luther King resulted in widespread rioting and later that year Democrat Presidential nominee Robert Kennedy was also assassinated, his killer citing Kennedy's support for Israel in the Arab Israeli conflict. In the cold war the stand off continued unabated, with the main change being the Soviets approaching Nuclear parity with the US. Finally, despite widespread opposition the Vietnam War grew in intensity, and by the end of 1968 US deployment reached its peak of over half a million troops. Against this backdrop it is not hard to imagine how, quite aside from intrinsic artistic merit of these films, the chance to peer into the future, both of humanity and film making itself, must have been tantalising. At this point I would like to suggest that both these films present what amounts to optimistic view of the near future. 2001 may have an ambiguous conclusion, but as an encounter with extraterrestrial intelligence it's definitely not Alien and Dave's journey is more one of transcendence rather than into the dark heart of man - certainly no trip up the Mekong River at any rate. Recognisable corporate and nation identities cement this universe as a linear progression of ours rather than some parallel existence. Planet Of The Apes may have elements of a dystopian nightmare, but the calamity revealed at the end of Schaffner's film is something which befalls some future human civilisation years after it had mastered the capability of space flight across hundreds of light years. The warning is clear but the signs are there's plenty of time for cavorting around the universe before we have to start to worry. In interpreting these films I think it is useful to include another work of speculative fantasy - Mechanix Illustrated's "What Will Life Be Like in the Year 2008? ", also published in 1968. Here, a vision of the future is presented unquestioned with an air of inevitability and enthusiastic optimism. For me the most critical essence of this optimism is the sense of cultural continuity - the prospect of replacing the drudgery of work and preparing meals with piloting spacecraft and driving 250mph cars is intriguing, but real reassurance comes from protagonists of the future being just like us and a vision of the present the political, social and scientific apparatus continuing to function and serve us. This vision is made all the more intoxicating by being rendered with a careful attention to scientific plausibility. What is particularly interesting about the Mechanix Illustrated story is that, beyond just a sense of cultural continuity, it has a tone of celebration - the triumph of science over nature and the ability of capitalist to deliver a homogeneous, happy civil society. So my thesis is not just that the form and popularity of all these works was in part a response to the political and social turmoil, but that the specific anxiety was one of continuity of the dominant ideology. Following on from this I find it interesting to speculate whether audiences would have been willing to accept science fiction with a more dystopian world, say A Clockwork Orange or Blade Runner, prior to the détente of the early 70s. In concluding I feel I should admit I'm not entirely sure I've actually seen the 1968 Planet Of The Apes and that perhaps my indistinct recollection of a large number of films with people in monkey suits is missing some other important interpretation, but somehow I think the brief monkey suit cameo in 2001 is probably the high point of this particular special effect. please drop me a line at chrisf (at) goop dot org. There's a blog at itchychinclub.blogspot.com to give some background and keep everyone up to date. In 1992, American neo-con philosophe, Francis Fukuyama, published a book, The End of History, or The Last Man, which claimed that, with the fall of the communist regimes in eastern Europe, the world had reached the 'end of history' in its current state of liberal capitalist 'utopia'. Of course, it wasn't long before history came along to bite Fukuyama from behind. In the meantime, fifteen years later, it does seem like something is missing. Not history, but in a sense, the future. In the middle of the last century, when people were first preparing to go into space, and electronic music was being produced by modernist composers and enterprising outsiders alike, the presence of 'actually existing socialism' in the eastern bloc provided a locus for both the utopian dreams and the dystopian nightmares of several generations. All of this came together in American science fiction films like The Day The Earth Stood Still, This Island Earth and It Came From Outer Space, in which space travel, electronic music and invaders from a red planet, formed a kind of symbolic unity. The scarcity of information about socialist society, as well as public knowledge of the tendency for what little information there was to be distorted by both sides, only added to its ability to act as a kind of fantasy space. In today's post-political society in which the public are systematically discouraged from taking an interest in politics, and political decisions are always presented as ideology-free, technical, administrative choices, we seem to have lost our grip on the future. Without a broad-based popular opposition to the status quo, we are left with the rather grim sense that there is no alternative. The future, as J. G. Ballard put it, is boring. Walking into almost any live music venue in Britain today, be it jazz club, concert hall or rock gig, one could be forgiven for thinking that, since the 1970s, history had in fact taken a few steps in retreat, or that a pan-generic cult of conservatism had taken hold at the root of all musical activity. Lecturers in 'Innovation Studies', surely a forward-looking discipline if ever there was one, write papers on the 'post-original' – a term suggestive of the idea that the very attempt to do anything new is now thoroughly passé. Even our science fiction films are remakes of old favourites like Godzilla, War of the Worlds and Transformers. And so what, you might say. The modernist demand for relentless innovation led to an art that lost touch with its public and the socialist 'utopia' in eastern Europe led to large-scale butchery and corruption. Good riddance to the future, I hear you carp. But behind these empty clichés concerning the Twentieth Century, what kind of baby are we throwing out with the avant-garde bathwater? Isn't the messianic promise contained, in different ways but equal parts, in revolutionary societies, stories about other galaxies, and music composed purely of electronic sounds, in a sense, the only real possibility of hope and transcendence: the promise of a better world in this world, i.e. before death and without the support of any mysticism or theocracy. "Kosmograd was a dream, Colonel. A dream that failed. Like space. We have no need to be here. We have an entire world to put in order. Moscow is the greatest power in history. We must not allow ourselves to lose the global perspective." "In an attempt to mislead spy plane pilots, Soviet cartographers three decades ago borrowed the name of the distant town of Baikonur for this space center near Tyuratam. Baikonur was misspelled "Baykonur" when it was taken for the spaceport. Then arriving rocket workers began calling the settlement Zarya, or "Dawn." As it grew it became known as Kosmograd -- Space City. Soon the city was officially named Leninsk." As the Soviet space program expanded, so did Baikonur, until it spread over a vast area of the steppe of what is now Kazakhstan. In 1960 Gary Powers photographed Baikonur from his U2. Built along the Syr Darya River and between highway and a railway, Leninsk and the Baikonur Cosmodrome is a prototype distributed settlement, a speculative disurbanist city, less planned but perhaps more vividly realised than Magnitogorsk. Mikhail Okhitovich would have been proud. Whereas Magnitogorsk was a city dedicated to producing steel, Baikonur's was dedicated solely to rocketry and space flight. At Baikonur, nee Kosmograd, Sergei Korelev, the father of Soviet space program declared, "The Road to the Stars is open". The protagonist, Colonel Korelev, the first person to set foot on Mars, has been in space 27 years. His bones have withered by the effects of radiation and micro-gravity, and crippled by an injury to his hip, means he can never return to Earth. As with all great SF short stories, we are given glimpses of the alternate future history that has preceded this moment in time, and left to fill in the gaps. With the Soviet Union controlling most of the Earth's resources, especially oil, the United States is no longer a dominant economic power on Earth. The Soviets have won the space race, but it is a Pyrrhic victory. Nations have turned inwards and no longer look towards the stars. Overtaken by Japanese robotic techniques, the manned exploration of space is no longer a project the Party can believe in. Kosmograd is to be put into a decaying orbit, and all its inhabitants returned to Earth. But General Korelev has been on the station so long his limbs have atrophied, he would not survive re-entry. His destiny is to die aboard Kosmograd. The story ends with a re-colonisation of Kosmograd by a band of Americans, daringly propelling their floating sun-balloon to the station. In homage to the home-brew hacker activism of Southern California, Kosmograd becomes a new homestead for a new frontierspeople. The story exhibits the classic prescience that makes Gibson such as great writer, exploring the idea that a space race and the colonisation of space is already an outdated conceit. As always, when Gibson writes he uses the future as a way of reflecting the present. Jump back to the near past, and the Russian space project lies tattered. Baikonur has become a graveyard of dreams as much as working spaceport. The collapse of the Soviet Union, and subsequent abandonment of the Buran project (a Soviet version of the Space Shuttle) consigned the idea of a permanent manned Russian space station to the past rather than the future. Only the International Space Station remains, a joint effort between the American, Russian, Japanese, Canadian and European Space Agencies. The Mir space station, on which Sterling and Gibson's space station is presumably based, was itself put into a decaying orbit in 2001. On May 12, 2002, one of the hangers at Baikonour, housing a Buran orbiter (the Soviet version of the Space Shuttle) and a mockup of the Energia booster rocket, collapsed due to incomplete maintenance, destroying the vehicle. Eight workers were also killed in the collapse of the building's roof. In 1991, as the Soviet Union collapsed, Sergei Krikalev was effectively marooned on Mir, spending 800 days in space, whilst no-one would take responsibility to bring him back to Earth. "It was a strange experience in 1991, leaving the Soviet Union and then being brought back down to another country, called Russia, because your old nation had simply ceased to exist." Krikalev must have felt a lot like Korolev, drifting alone, abandoned, The Last Man in Space. The next Kino Fist will be on the theme of RED SPACE, and will be held at 2pm, 20th July, in the E:vent Gallery, 96 Teesdale Street, Bethnal Green, London E2 6PU. The films we will be showing are: as the cartoon, Khodataev & Kollektiv's 1924 short Interplanetary Revolution, as the main feature, Iakov Protazanov's Martian Constructivist-Trotskyist blockbuster Aelita, from the same year; and as our B-Movie, Harry Horner's magnificently ludicrous McCarthyite farrago Red Planet Mars. 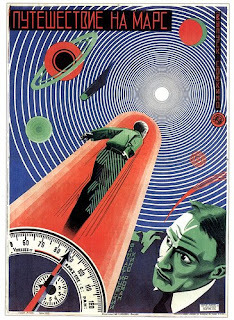 Anyone who wants to contribute anything from 500 to 6000 words on the general themes of science fiction, cinema and socialism is encouraged to fling it in our direction to infinitethought[at]hotmail.co.uk, no later than 13th July. To get you started, here's China Mieville's 50 Fantasy and SF works every socialist should read. By the way, Kino Fist are looking to start screening short non-commercial films before the main feature. If you would like to send us something you've made (no dead animals) for potential screening (preferably 20 minutes or shorter and related to the general themes that KF are into), then send an email to infinitethought[at]hotmail.co.uk.